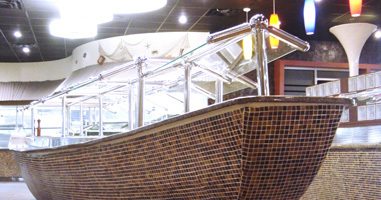 Indianapolis has a new ultimate experience in buffet - style dining! As soon as you enter The Journey, you will immediately be swept away by the beauty of our contemporary decor designed to enhance your dining experience. The use of natural materials like stone, wood, granite, and glass tile have been combined to create an invitingly bright, warm atmosphere that sweeps you away. Whether you are dining alone, or with a large ground, we have thought of you! Seating for private parties, and beautiful conference and party rooms are available for those special occasions. The Journey is truly a unique, colossal Sushi - Prime Rib and seafood buffet featuring only the finest and freshest ingredients to create for you a memorable journey in our Japanese/American inspired cuisine, which you will not soon forget! Sushi is our specialty and we offer lots of it! Our guests enjoy over 30 selections of Sushi and Sashimi that are not only skillfully prepared, but artfully presented as well. Our Prime Rib is the finest cut of USDA Choice beef that is slowly roasted to insure a delicious, juice, delectable experience, and is served to your liking to enhance your Journey experience.